Usage notes: As every red-blooded American – and savvy shopper – knows, the day after Thanksgiving in the United States is the official start of Christmas shopping, known as Black Friday. 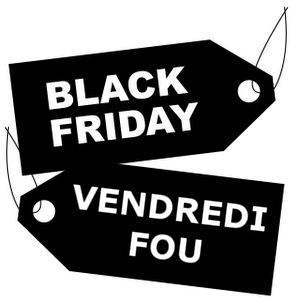 One of the biggest sale days of the year, this unofficial holiday has been seeping northward into Canada, where it is sometimes referred to as Vendredi fou. 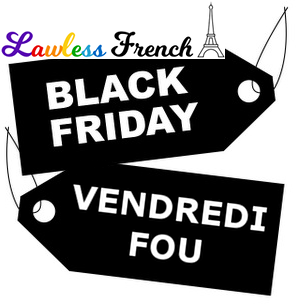 * However, this is not a standard French expression; in fact, when this same sort of sale takes place in France, it’s typically called, in good franglais, le Black Friday. J’ai besoin d’un nouveau mobile, mais je vais attendre le Vendredi fou. I need a new cellphone, but I’m going to wait for Black Friday (to buy it). Trop de gens doivent travailler le Vendredi fou. Too many people have to work on Black Friday. * Why not Vendredi noir? That term typically refers to a tragic event that occurred on a Friday, such as the Saint-Quentin-Fallavier attack (2015) or the Edmonton tornado of 1987.